Premium Standardized Ginkgo Biloba Extract (50:1) Clinical tests have shown that Ginkgo Biloba is a safe and natural dietary supplement that may improve brain performance, such as memory, cognition, mental alertness and concentration. This is believed to be achieved by stimulating the circulation and oxygen flow to the brain. 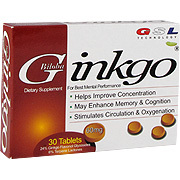 GSL uses the highest quality standardized Ginkgo Biloba extract to ensure these unqiue functions. Adults over 12 years of age should take one tablet twice daily with water at meal times. Take consistently for optimum benefit. Caution: This product can be a choking hazard. Keep out of reach of children. If you are taking medication, pregnant or nursing, consult your health professional. Discontinue use two weeks prior to surgery. Store at room temperature. Avoid high humidity, direct sunlight, and excessive heat to maintain optimum potency and freshness. Other Ingredients: Dicalcium Phosphate, Cellulose, Stearic Acid, Croscarmelose Sodium, Magnesium Stearate, Riboflavin, Titanium Dioxide, Yellow #6, Blue #2, Hydroxypropyl Methylcellulose and Polyethylene Glycol.